Few filmmakers working today present moviegoers with truly breathtaking and viscerally rewarding films that push the medium forward. Director Alejandro G. Inarritu, the reigning Best Director Oscar champ for “Birdman,” gives us a completely different vision that's no less compelling and fascinating to watch. While “Birdman” was a play-like black comedy about a washed up Hollywood actor attempting a comeback, “The Revenant” is a harrowing American frontier-set survive-the-wilderness revenge thriller. Inarritu calls upon two time Oscar winning cinematographer Emmanuel Lubezki again to shoot a very Terrence Malick-like meditative survival story filled with ingenious camerawork and gruesome onscreen violence. Even if the basics of the story are nothing new - “man left for dead seeks redemption” - the film feels unlike anything you've ever seen before. I'm not sure who really deserves top billing in “The Revenant” because the camera gives as good a performance as Leonardo DiCaprio. 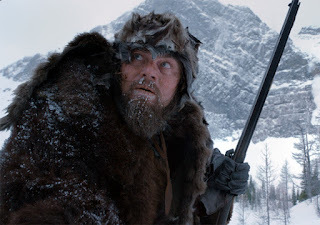 He plays Hugh Glass a fur trapper who's part of a larger military-like group on an expedition in the unclaimed land of the Midwest to bring back pelts and furs. A surprise ambush from a local Native American tribe (almost Saving Private Ryan-like in its execution) leaves many of his men dead and the rest on a raft down the river to safety. But then a violent bear attack leaves Glass barely clinging to life and the men under order from Captain Andrew Henry (Domhnall Gleeson) decide to attempt to carry him back to their outpost camp. Fearing they won't be able to make it with Glass in tow, Henry orders several men behind including Glass' Native American son Hawk (Forrest Goodluck), the young Bridger (Will Poulter), and the ultimately conniving Fitzgerald (Tom Hardy). One thing leads to another and Glass if left all alone in the wilderness with nothing but the glorious taste of vengeance on his tongue. Have I mentioned the thrilling camerawork enough? Lubezki shot the film (digitally) with a new camera and even used all natural lighting. Some shots are breathtaking, others will make you wonder how exactly they pulled it off (Not to mention some truly great computer generated trickery). Inarritu, hot off his Oscar win and showcasing his unique eye of visual storytelling, employs many long takes including the camera going from subjective to object points-of-view without cuts. The camera work is sometimes beautifully pensive and yet it really captures the brutality of the land and wilderness. It was reportedly a brutal shoot; and every bit of that is captured within the frame. And what of the film's main star? DiCaprio gives a riveting performance (as does Hardy), who doesn't even speak most of the time. His desire to withstand the hostility of his surroundings: deadly wildlife, rugged terrain, uncompromising weather conditions, and violent human adversaries culminate in one amazing struggle to survive and every suspenseful moment is registered on the actor's face. You really get the sense that danger is lurking behind any rock or tree. And even if the film itself is long (it's about 156 minutes) it never feels boring or dragged out. Some will probably find some of the contemplative elements could have been trimmed out but it fits with the nature of the Glass character and his specific connection some of the Natives. Trailer for The Revenant on TrailerAddict.